Step inside the first milestone on the elite and demanding road to Master Sommelier with The CD. My heart pounded as I took the microphone. I was about to do something absolutely terrifying: I had to identify a wine from a blind tasting in front of four Master Sommeliers and over 90 fellow students. If there was ever a moment when I’ve felt what Sheryl Sandberg rallied against in her Lean In – the “impostor syndrome” that moment was now. Picture this: You, along with four others students stand up in front of a room full of students in the wine or restaurant industries. One by one, each student must identify a particular set of deduced characteristics of one wine (sight, nose, palate, structure, preliminary identification, and conclusion). You know everyone else feels for you and, at the same time, is judging you. My turn came for the 4th wine in our first student-led flight. I did not have the benefit of watching the majority of other students attempt to do so. Luckily for me, I found that the jammy nose was matched by a fruit-forward, yet restrained blast on the tongue – familiarity. Whew! A California wine! Low acid, moderate tannins, high alcohol, almost purple in hue; it must be Zinfandel, I thought. Slightly more structured, with a hint of bittersweet tobacco on the finish, so it’s probably Sonoma County and not Napa. I rambled off my final conclusion – Zinfandel, USA, California, Sonoma County, 2012 – and was correct! Ok, except for the vintage (2014 – rookie mistake). I felt a wave of relief – and boost of confidence -after my turn concluded. Perhaps I wasn’t such an impostor after all! That moment – and not my final examination – defined the two-day course for me. While I’ve always enjoyed the sense of discovery of place (terroir) and craft in the nuances of wine tasting, I realized that I absolutely love the challenge of a deductive tasting. It might be the most fun sort of investigative and analytical work I’ve ever done. Deductive tasting – like many things in life – is part art, part science. And it’s overwhelmingly learned through experience – not so much palate as one might think. It requires one to pull through that vast memory bank of both factual knowledge and experience. So the good news to anyone out there who loves wine but fear they’re not “born that way” (with the ability to taste, say, tobacco, white flowers, mango, or leather in a wine): You can learn! Lectures are designed to help students review the highlights of the world’s major wine producing regions – their grapes, traditions, and laws, as well as basic knowledge of beer and other alcoholic spirits. Students are expected to come to the course having already learned and studied this material in more depth. The lectures thus are tantamount to a two-day world tour, bouncing from country to country (or appellation to appellation) in mere minutes. Each of the four Master Sommelier instructors alternates as lecture. Each of the seven (four each day, including the lead instructor) Master Sommeliers offered a distinct personality and style. “Somm” viewers recognized Reggie Narito, a Master Sommelier who served as a talking head in the documentary. (In case you’re wondering, the documentary did not do his larger than life personality justice. A particularly funny joke about Green Chartreuse during his lecture on spirits resonated with me, reminding me of an education I had with the stuff in Latvia). This mental overload was, thankfully, interrupted periodically by each of five deductive tasting flights, four of which are student-led as discussed earlier in this post. The five flights culminated Sunday afternoon with a mock deductive tasting examination, consisting of two wines and a written test. This activity simulates the deductive tasting portion of the three-part, Certified Sommelier Examination (Level 2). 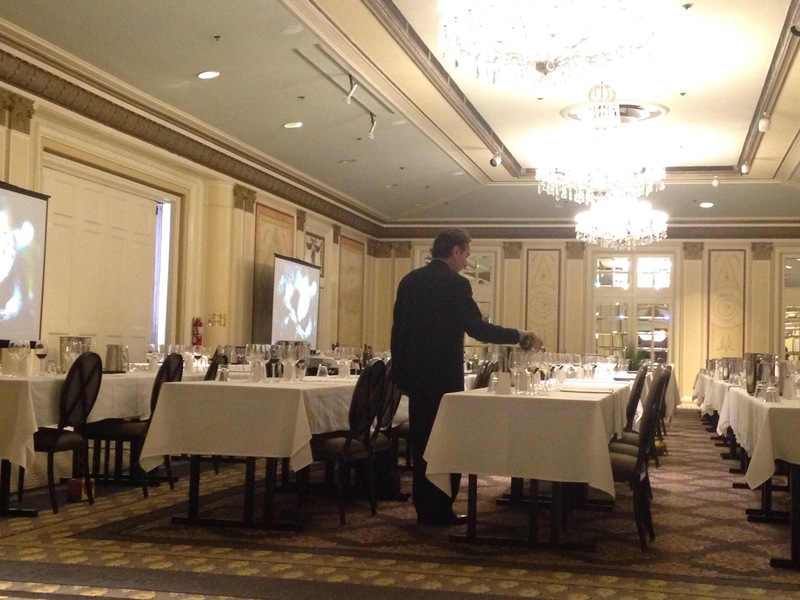 A service demonstration helps students visualize the Court of Master Sommeliers’ strict standards for fine wine service. If you’ve ever been served wine in a truly great restaurant by a true sommelier, you have witnessed the elaborate and formal dance that includes bottle and cork presentation, corkage, (optional) decanting, tasting, and serving order. For each step visible to the customer, the sommelier takes perhaps four more actions that are noticed by only the most vigilant of wine connoisseurs. 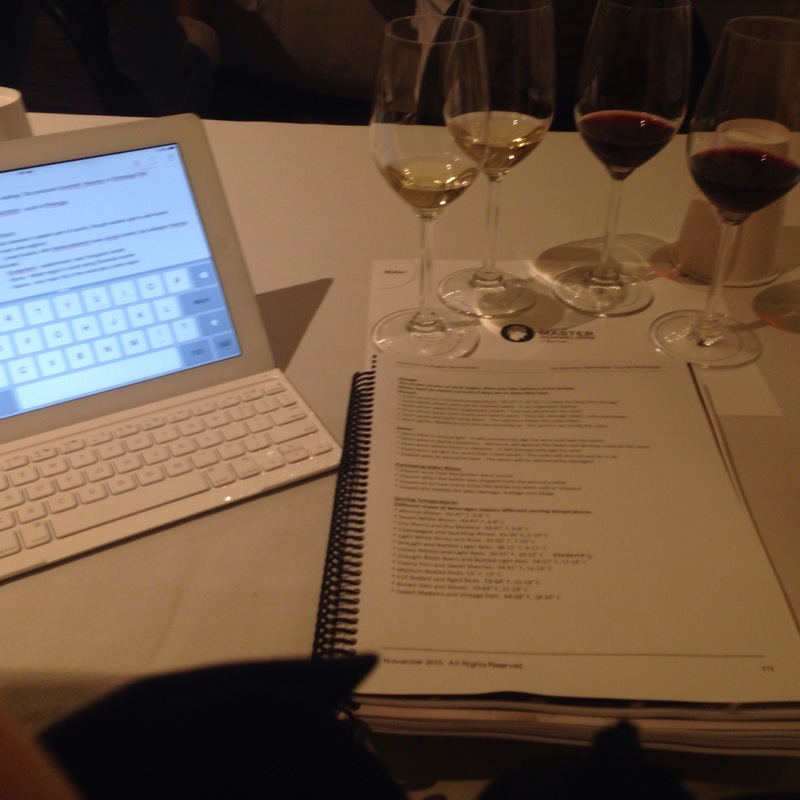 The two-day global wine marathon concluded with the final examination. The test anxiety was almost palpable in the air by test time. It was at this point when I sympathized with my classmates who specialize in wines from a particular region – whether retail, restaurant, distribution, or winery. I also empathized with my classmates who had gone straight to work for a Saturday night shift at their bar or restaurant after Day One. A generalist and rookie like me was in the strangely more enviable position. The test itself – I will divulge nothing specific – covered an impressive range of both specific and general wine and sommelier service knowledge. The questions were a mix of what some of us later termed “softball” questions and some really tough, specific (what I call “Whiskey Tango Foxtrot” questions). I handed in my exam with the confidence that I’d at least passed the thing. After time was up, all students were called back to the room. We were informed that not everyone passed but were eligible to re-take the course (To be eligible to take the Level 2 exam, the Certified Sommelier Exam, one must pass this exam). One by one, the lead instructor called out the names of only those that passed, the other Master Sommelier lecturers handing out certificates and pins. Rumor has it that the names are called in reverse order of score, with the final names as the highest scorers in the class. If that’s the case, mine was in the respectable middle of the pack. I suffer from a lifelong disease. Some of you may be familiar; it’s called overachieving. Do any of you ever accomplish something, only immediately to start looking at what’s next? Maybe the fact that passing this exam didn’t get me a title or certification got me. Don’t get me wrong; I have learned so much more about wines around the world. I am happy to be able to say that. But now I’ve got to chase that title: Court of Master Sommeliers’ Certified Sommelier. It may seem silly for someone not actually employed by the “industry,” but that’s my logical next step. It just means I have a reason to learn more about wine – and sample more! And so I left the two-day course with a certificate in hand and recognition that the more I learn and know about wine, the more I realize I don’t know! In my next post, I’ll share a few lessons learned from my studies about wine – and rookie mistakes to avoid!